The combination of clear instruction, inspiring tone, and personal experience make this a compelling guide for getting healthier quickly. Although two weeks might seem a scant amount of time to overhaul a lifetime of poor health habits, Fourteen Days to Amazing Health outlines a plan for doing just that, proposing that such a brief restart can have long-term benefits. 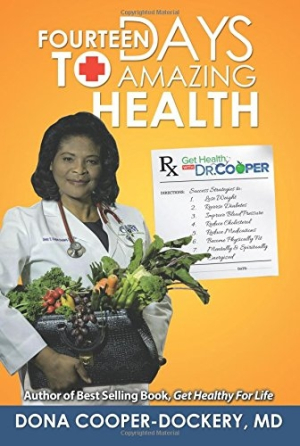 The program is derived from the experiences of the author, physician Dona Cooper-Dockery, who initiated a fundamental shift in her practice when she began seeing increasing incidence of obesity in her office in southern Texas. Noting that even those who face serious issues like diabetes, obesity, high blood pressure, and high cholesterol can turn their chronic conditions around—or at least alleviate significant symptoms to some degree—this guidebook describes first steps toward better fitness, mental focus, and spiritual energy. As she details in the introduction, Cooper-Dockery explored the root causes of chronic illness, rather than focusing exclusively on diagnosing and treating disease. She integrated lifestyle medicine into her internal medicine practice, and noticed that patients who followed her principles were showing success in reducing or even eliminating medication, regulating blood sugar, and losing weight. That’s when she decided to give the program a wider audience with a television show, magazine, and this guidebook. “There is absolutely no reason to remain fat, sick, and unhappy for the rest of your life,” she writes. That gung-ho attitude not only kicks off the carefully outlined tips and insights provided, but creates a sense of urgency as well. This program is simple, which is a large part of its appeal. Unlike some complicated health directives, Cooper-Dockery’s suggestions are pared down to what’s most important for someone to implement within fourteen days. The program focuses quite a bit on nutrition, arguing that proper eating can have a ripple effect across all other aspects of health, including sleep, physical activity, and even mood. The connections are clear and compelling, which will likely be useful to those who feel reluctant to overhaul their diets. Cooper-Dockery says that many of her patients who have taken this “food as medicine” approach have become happier, healthier, and more fulfilled. Much of what the book discusses has been widely covered in other books and articles, including the need for healthy fats, why fruits and vegetables are crucial, and the importance of whole grains over refined grains. Still, the book delves into such familiar topics with an infectious enthusiasm that gives the material a fresh spin. Best of all, Cooper-Dockery often weaves her own experiences into the mix, sharing information in stories about patients who’ve struggled with healthy eating and physical activity. Through this combination of clear instruction, inspiring tone, and personal experience, the book delivers on its promise of being a guide that truly can help anyone become healthier in just a couple of weeks.